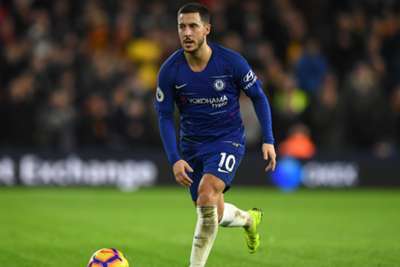 Chelsea head coach Maurizio Sarri said he would use Eden Hazard as his team's centre forward again in the future after the star impressed in the role against Manchester City. The Belgium international started up front and set up goals for N'Golo Kante and David Luiz as Chelsea inflicted City's first league loss of the season with a 2-0 win on Saturday. "He had some problems at the beginning of the match, but I think he played really a very great second half. Maybe he deserved to score," he said. "I think it's a very good option. We will play like today in the future for some matches of course." Sarri's switch meant Alvaro Morata was left out of the squad, with Olivier Giroud starting on the bench. "The reason was clear. We played with Hazard as a striker. So if we have to change something there was Giroud," Sarri said. "I think it was useless to have two strikers on the bench and I prefer to have more midfielders. "I was in trouble with the wingers. The only option was Loftus [Ruben Loftus-Cheek]. I prefer this."